The aluminium Aero radiator range is our newest design for 2019, the result of years of experience and months spent researching the latest trends. The Aero occupies a previously unfilled yet much called for niche in the radiator market. Aluminium radiators have always unavoidably come with a price tag. Although justifiable when you consider all of the advantages, here at Geyser we were determined to find a more cost-effective range without any compromises. A high heat output, modern design, European build-quality and fashionable textured finishes were still major priorities in our search, to meet the new expectations of a contemporary home. So please allow us to introduce the Aero range. Available from stock for next day delivery in 4 different finishes and 8 different sizes, the Aero is completed with a subtly curved sleek exterior. Gone are the days of flat-panel radiators, replaced by the soft edges and curves of the slimline Aero, allowing it to blend in to any room and delicately complement any decor. With both vertical and horizontal models, we have developed a range that is made entirely from fusion welded aluminium. In comparison to aluminium radiators that are built using steel pins or compression, the aluminium Aero is much more robust and long-lived with more stable water-tight internal connections. This is reinforced by rigorous testing and the non-corrosive properties of aluminium itself, providing a stylish radiator that will outlast comparable alternatives by far. Aluminium is highly conductive, making it a great material for heat transfer. As a result, the Aero will heat up quickly using both radiant and convected heat and need much less water to do so. This means it is kinder to your boiler and more economical, costing less to run. This is a win for the environmentally-conscious out there, or anyone who would like to reduce energy use in their home. Another up-shot of this are the great heat outputs. A more efficient radiator can afford to be smaller whilst maintaining a high output. 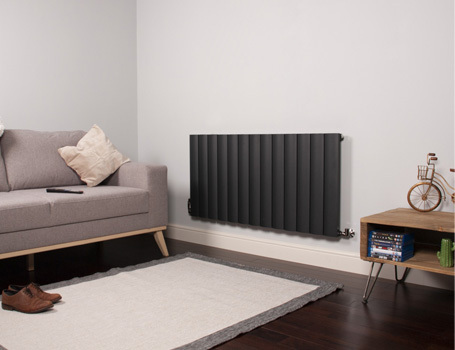 The Aero comes in a variety of sizes, ideal for smaller and larger rooms alike, but crucially only measures 80mm from the wall to the front of the radiator. This slimline profile is not only practical to save space, but also acts to accentuate the softly curving exterior with minimal gaps between the bars, making the Aero flow in to its surroundings. Aluminium is a very lightweight material, meaning it can be installed on most wall types, including those previously not suitable for out-dated heavier mild steel radiators. Whereas before you might have had to compromise, now you have the freedom to place a radiator where you want it, whether that be close to a well-loved family area or to simply use a piece of unused wall. The addition of a chrome towel bar can turn the Aero in to a striking heated towel rail. The bar stylishly loops across the front and discretely connects on the reverse. This means that finally, every room in your home, including the bathroom, can be fitted with the latest in aluminium radiator design and functionality without breaking the bank!